Having to worry about your safety while traveling solo is a bummer. With all of disturbing news surrounding terrorism, violence against women, and the significant rise in street crime, preparing yourself for an unwarranted safety event is a wise thing to do. In addition to researching a country's cultural dos and don'ts, packing key safety gadgets for your trip will ease your fears. Solo travelers who want to see the world don't want to be overly afraid or caught off guard. The following travel safety essentials are what I use to relieve my concerns when traveling solo. Most credit and debit cards have personal, embedded data that cyber hackers can easily access by using portable scanners or readers. One of the few ways to successfully stop this potential for electronic pickpocketing is to use some type of protective shield such as an electronic blocking sleeve or wallet. Since my first trip to Russia four years ago, and on all of my many international trips since, I have used the aluminum RFID protector wallet seen in the photo and have had no cyber theft problems. This style of wallet can be purchased through many stores and websites, including Amazon.com. It comes in a variety of colors and the price ranges from $10 to $20. On my last trip, a solo driving journey from Miami to Maine, I forgot to bring my RFID protection wallet because I did not think I would be vulnerable to identity fraud in the upscale places where I was traveling. I was wrong! Two of my credit cards were compromised on two different occasions, which left me with only one to spare. Lesson learned: I will never travel without my RFID protection wallet in the future, regardless if it's a trip close to home or abroad. Who would have ever thought the lowly whistle would be a great solo traveler's safety companion? In countries and cultures where solo females could be targets for harassment, it's a good idea to have some type of non-lethal, legal weapon at your disposal. While I don't carry this item all the time, I will wear a whistle around my neck and tuck it into my shirt if I plan to be walking in unfamiliar areas that could cause some safety concern. If I start feeling a little uncomfortable, I will take it out and wear it like a necklace. Blowing a loud whistle and yelling "help" will more than likely scare away a potential predator or an unfriendly animal. Also available on Amazon, whistle prices start at less than $5 with many different types and colors to choose from. Some are highly sophisticated with an extremely piercing sound such as the Fox40. In the event your phone or GPS fails due to battery loss or no cellular signal, the whistle could be a lifesaver! You don't usually expect the lights to go out or your hotel to lose power, but it can happen and it's scary when it does. I experienced this in China and was glad I had the foresight to pack a mini flashlight in my purse. Most phones today have a built-in flashlight, but, in the event that your phone dies, you don’t want to end up in the pitch black dark in an unfamiliar place. It's easy to get into panic mode. With a flashlight you can regain your composure and decide what your safety options are. Don't leave home without one because you never know when the lights will go out. Feeling vulnerable in your hotel room definitely does not make for a relaxed solo getaway. Whether you have reason to feel this way or not, having something at your disposal to relieve this fear is a good idea. Many luxury hotel doors have double locks and bolts, yet many newer doors have sophisticated entry abilities that can be tampered with such as card entry. Ten years ago, I discovered the value of the wedge door stop while on a trip to London. My talented interior designer sister, Heidi Holloway Core, keeps up with who's who in interior design. She knew I would be traveling to London and suggested I visit Viscount David Linley's interior design store on Pimlico Road in Belgravia. It was such a treat because I got to meet Linley himself and have him sign a beautiful cocktail table design book for me. While perusing the many bespoke interior items in the shop deciding what to buy for my home, I, oddly, settled on a door stop (a unique and memorable item I didn't already own). In the store I had an "ah ha" moment when I realized what a great travel safety accessory the door stop would be. Now this fancy door stop travels with me regularly to be used in my hotel room if I am feeling vulnerable. I don't recommend investing in a Linley doorstop because of the price, but I do recommend buying an inexpensive one that can be bought online for as little as $1. 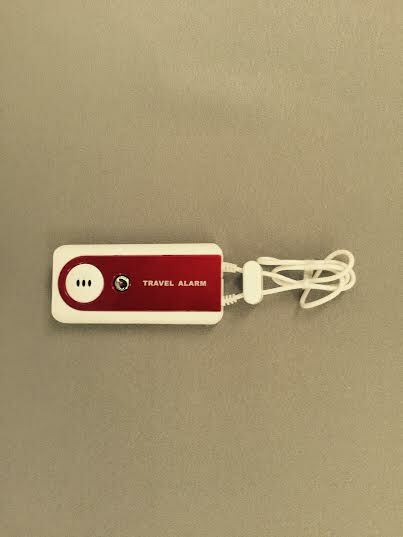 For solo travelers who are afraid to sleep alone in a hotel room, a travel door alarm is for you. I bought my first travel alarm before I went to China since I was unsure how I would feel sleeping in a hotel where I don't speak or read the language. I decided it would be smart to be prepared for an unwanted entry into my hotel room. I'm not one to be overly afraid while traveling solo; for me, this looked like a good gadget to give me some options if the unthinkable occurred. I ended up using the travel door alarm in only one Chinese hotel even though the concierge told me this was one of the three safest places to stay in Beijing. He shared the hotel was ultra-secure with cameras and hidden armed police on every floor. For some reason the added security scared me, so I used this device and slept soundly. Check out my video below and see how this device works. It would scare even the devil! For around $60 you can purchase these highly effective solo travel safety gadgets. It's always a good idea to be prepared for an unwarranted safety event. Other helpful gadgets exist but these five are my absolute must haves. With that said, recently I purchased an Apple Watch which I plan to use to help me get around on my solo travel trips, among other things. Look for my upcoming post where I will share the logistical and personal safety attributes of this stylish, highly utilitarian device. My guess is the Apple Watch will be the next item added to my solo safety gadgets must have list.